Kathy DeAngelo and Dennis Gormley are the husband-wife duo who have been performing traditional Irish music together in the Delaware Valley (South Jersey/Philadelphia region) as McDermott’s Handy since 1979. With a repertoire they’ve built over 35 years of playing traditional music, they sing in Irish and English. Kathy mainly plays harp and fiddle and occasionally adds 5-string banjo and bodhran. Dennis plays guitar, flute and tinwhistle and can be counted on to add in mandolin or bouzouki when the arrangement requires. They take their name from the 75-year old fiddler Ed McDermott, who Kathy met in 1971 when she was just starting college. He introduced her to the traditional Irish dance music. They became good friends. Kathy eventually revitalized the Mine Street Coffeehouse in New Brunswick and had Ed McDermott in to perform many times for the college crowd. Many of the young musicians flocked to hear the senior musician play and he taught them about Irish music and fiddling. Kathy helped to start the New Jersey Folk Festival and of course had her mentor perform at the first two festivals. He passed away on January 1, 1977 and many musicians who learned from Ed gathered at the third festival to perform in a living musical tribute to him, calling themselves McDermott's Handy. 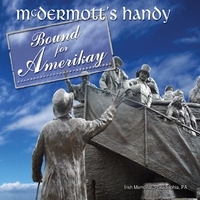 There's been a McDermott's Handy ever since! Kathy and Dennis began playing together in 1979.